This is the second in the “Guidepost” series. The first post described using Instagram as a guide for our personal journeys. In this post, Strava is discussed as a more focused guidepost that can keep us on our trail towards a specific goal. Yes, I realize the issues with using a social media site like Strava or Instagram as personal guideposts. After all, social sites are all about likes, comments, expanding your reach, and going viral, right? Stick with me for a bit and let me explain my idea for using Strava to guide us to a specific goal. 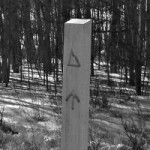 In the trail world, a guidepost is a marker that provides direction and informaiton for people traveling the trail. We’ve all seen them marking our way on trails. They help identify intersections, let us know distances, and above all keep us on the right path. What about when we’re not on trail? How can we keep on our chosen path? Whether it’s training for a bike race, wanting to get more running miles in for the year, or building towards and multi-day bikepacking trip, we need personal guideposts to keep us on that path. If the goal is more cycling or more running, Strava can help. Ignoring the social and competition aspects of Strava, it’s basic feature is a method to log your workouts. With the workout data, the app provides statistics and charts of your training progress. Like Instagram, Strava can be accessed from any device at anytime allow you to see the summary and details of your training. As Gold Five said in Star Wars, “Stay on target”. Let Strava be that guidepost that keeps the goal in focus. In a world full of distractions, the key to reaching a goal is focus. Is that guidepost for your goal front and center and blinking at you to keep you on track? If not, other things will take away that focus and send us off onto another path. Strava is always there and it can be that beacon that keeps the goal in focus and guides us to the finish.